In one of the uglier performances in recent memory, #5/6 Miami was swept in St. Cloud by the Huskies this weekend by 3-1 and 3-2 scores. Offensively, Miami could generate little against a team that came in 7-10-1 and looked listless with the exception of the first period of Friday night’s game when they registered 17 shots on goal and should have buried the Huskies for the weekend. Alas, the RedHawks did not dent the scoreboard and gave SCSU hope and momentum, dangerous living indeed against a desperate team. In fact, this weekend looked a lot like last year when the travel-weary RedHawks could generate little energy. We said in our preview the weekend would be tough. Miami has now played six consecutive games away from home since December 28. They MUST get back to the winning side of things when they welcome in another road-weary opponent, Denver, who was swept themselves in a road series at Omaha after playing in a holiday tournament in New Hampshire (v. Dartmouth, v. Brown) the weekend prior. Before heading out to play Miami January 23-24 in Oxford, the Pioneers have a home series against SCSU meaning they’ll have flown to New Hampshire, Omaha and back to Denver before again flying to Oxford. Miami should take advantage of that heavy travel schedule and get an important home sweep of a league opponent. The RedHawks will have a much needed week of rest and need to refocus their game before the Pioneers come to town. Thoughts after last night’s 8-2 whipping of #12 Omaha. Overall, it was a thorough beat down as Miami rattled off seven consecutive goals after actually surrendering the first goal of the game just 4:14 in. Six different RedHawks combined for the 8 goals with senior Cody Murphy notching a natural hat trick (3 consecutive goals) while Kevin Morris, Matthew Caito and Michael Mooney found the net for the first time this season. For Mooney, it was his first career goal, shorthanded, while the Omaha net was mysteriously vacated by Omaha head coach Dean Blais, despite trailing 7-2. Bit of a bush league move if you ask us. Senior captain Austin Czarnik recorded four assists, including his 100th and gave up an opportunity to record his first goal of the season when he passed the puck to Mooney on a 2-on-1 break. On the year, Czarnik has a 0-16-16 line in what can only be described as a bizarre start to his senior season. Thinking more about Czarnik’s scoring line, I wonder if it’s something having to do with last season when this team seemed to be all about individuals rather than the greater good. I wonder if it’s a sign of maturity as a leader on this club that Czarnik isn’t trying to do to much. That he’s more comfortable with the ‘C’ on his sweater? While I still have some leadership concerns with the ‘C’ I think the formal addition of Sean Kuraly and Blake Coleman as assistant captains was an appropriate move. Coleman was a bit out of his mind last night, but you have to like the combination of skill and snarl he brings. He’s tough to play against and will make his presence known to the opposition when he doesn’t like something. – Depth: This team has it. It didn’t last year. I believe Tim Bray said 14 Miami skaters have tallied goals this year and that, amazingly, does NOT include senior captain Austin Czarnik who entered 2014-15 with 37 career goals. – Goaltending: Jay Williams was good, not great last night. I’m sure he’d like to have the first goal back scored off an ugly rebound of a harmless point wrist shot that hit him square in the chest. But, with this offense (and really any offense), two goals or less should get a W and Williams now has 11 of them this year. Those 11 wins are just one short of his career high set his freshman year, the last year of existence for the CCHA. Despite his success, I could see Miami head coach Enrico Blasi give Ryan McKay a start tonight since he hasn’t played in a few weeks. However, this is another important league game. I’d rather see Williams again tonight and then give McKay a start in the Florida College Hockey Classic on either December 28 or 29. There’s certainly no fatigue issue with Williams, or shouldn’t be, because Miami is coming off a bye week, and will have two off-weeks for exams and Christmas before heading south. – Attendance: 2,006? For a matchup of top-15 top-12 squads? I really don’t know what’s going on in the SW Ohio area. The Reds don’t draw. The Bengals don’t draw. And now, Miami hockey doesn’t draw. Admittedly, I live in Denver and my partner-in-crime Miamibeef04 lives in Columbus. However, Beef was there last night making the two hour drive south. 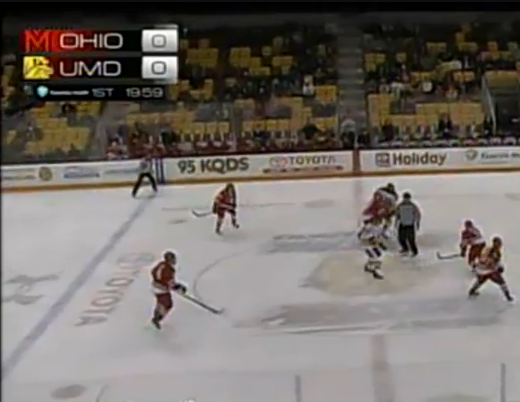 Just because it’s no longer Michigan and Ohio State is no reason that building isn’t full. Here’s a rundown of Miami’s home attendance this year. Because capacity has never really been settled — is it 3,200? 3,642? 4,000? — I’m going with 3,200 to qualify as a sellout. Frankly, this is pathetic. You have a top-5 team again. It was one bad season last year. That there aren’t at least 3,000 butts in seats (seriously, it’s not a big building to fill) each night is embarrassing. I don’t want to hear about the new seat licenses, though surely that hasn’t helped. Tickets are available. If you don’t want your season tickets anymore, fine. Walk up and buy a ticket. Good seats still available. I can guarantee you I will be at Magness Arena here in Denver and World Arena in Colorado Springs when Miami visits the Centennial State twice in February. Get to the games, people! – Tonight: Miami and Omaha will complete their NCHC weekend series, and the season’s series, tonight at 7:05 PM at Steve Cady Arena in Oxford. Here are Miami head coach Enrico Blasi’s short postgame comments in what can only be described as the BG dungeon of a “press room” following last night’s 3-2 loss in the season opener to the Falcons.